Price & Quantity: INR 375 for 3.9g. 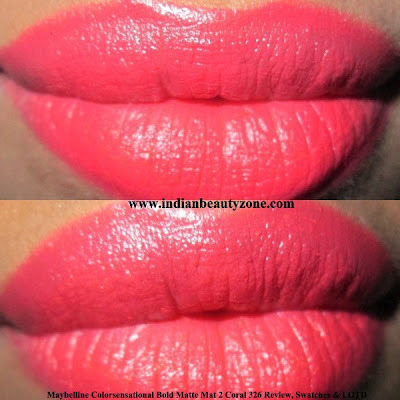 Maybelline Color Sensational Bold Mattes Mat 2 Coral 326 has a mattifying milk which gives a hydrated matte finish. Hydrating matte with nourishing agents like honey nectar, jojoba oil and Rosa canina. Powder-less matte pigments ensure true vivid shade. The packaging of this lipstick is quite attractive and chic. The beautiful red and steel color packaging makes it look very classy and trendy. At the bottom, the shade number and name is written on a sticker which is of the same shade of the lipstick. This makes it easy to recognize shades among many. The bullet is quite sturdy. The texture of the lipstick is very creamy and to my fancy, very velvety! The creamy bullet helps to glide on the lips very smoothly and evenly. 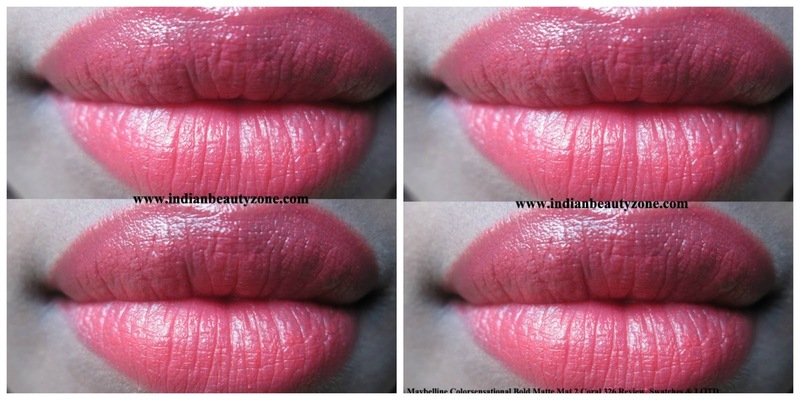 Though it is called matte and it looks also like it; but it is not at all dry. The soft velvety lipstick keeps the lips balanced in moisture and does not cause any chapped lips afterwards. The staying power of this lipstick is amazing. Including my lip smacking and drinking liquids, it stayed intact for 6-7 long hours. 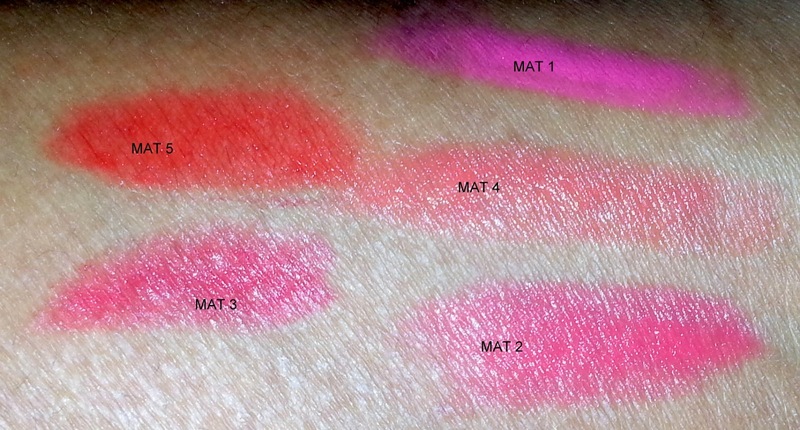 It does not settle in fine lines (one great thing about any matte lipsticks!) or fades. The velvety and satin finish makes it look very nice and attractive. The only anomaly is it leaves a coral tint on the lips after wearing it for long hours. One of the best quality makeup brands. Nice velvety and creamy texture. Very affordable price, and also cost effective. Easy to glide on the lips. It leaves a tint after removing. I loved the bright reddish coral shade, the lovely packaging, and the soft creamy texture of this lipstick. In my opinion, this shade will look very nice on medium to fair skin tone. This particular shade might not suit dusky beauties. The staying power and the whole experience is more than satisfying for me. So, my both thumbs up for this one! Hi, I am Arshita and I am persuing my heigher studies, also trying my hands in writing about fashion and makeup. I am a happy-go-lucky girl but also very sensitive and with a very friendly nature. the color is sooooo pretty and matte too :).. i am buying this! I have to try a matte lipstick! they look gorgeous! I think I'd love to buy it because the shade is def my kind! Pretty shade.. I'm afraid of bold shades.. I am loving the color but matte doesn't fit for my lips. I love this shade and the result on your lips is amazing!!!!! The shade is great Arshita and it looks great on you..
(k) loved the shade dear!